Thanks for listening to this special bonus episode of The People People Podcast! You're one of us, aren't you? You're a people person. But you get that being a “people person” isn’t just about being chatty and smiley and super-duper nice, it’s about transforming the world through relationships. You're one of those people who understands that HUMAN CONNECTION is the key to everything. You're one of those people who understands that humans are social animals, and we're all deeply longing for real, meaningful, deep-spirited connection in all aspects of our life. You're one of those people who understands that the secret to creating the world you want is found in your ability to connect. You're one of us. We are people people. And you found our show. This is a special bonus episode featuring the host, Matt Mattson, and his daughter Elliotte. Listen in to try to imagine human connection through the eyes of a child. There’s a button above if you want to buy a copy of the book that Elliotte wrote (referenced in the episode). I sat down and started recording. I honestly didn’t think I’d ever use the recording. It was the first “interview” I had done and I was kind of just goofing around. But after listening to it (and I might be a little biased), I thought it was podcast gold! Try to see the world through a kid’s eyes. Try to imagine their point of view. Remember the simplicity of friendship as a kid, and how it started to get complicated in late elementary school, middle school, and high school. Thanks for listening to Episode 9 of The People People Podcast! Mike Dilbeck’s name has become synonymous with the idea of “bystander intervention” in some circles. He’s established himself as a guru who helps people and organizations make courageous choices in their lives. From Mike’s website: “Mike is leading a call for courage and a demand for dignity — empowering us to go beyond fear and shame by standing up, stepping in, and speaking out while also honoring the dignity of others…and ourselves. In this episode, Mike and Matt vulnerably talk through those moments from our past that shape us… those moments that shake our very sense of human dignity… those moments like the one in the Piggly Wiggly parking lot… those moments like the one walking home from Pizza Hut… those moments like the one in Macy’s… (listen to the show, you’ll know what we’re talking about). We all just want to belong, and when moments happen in our life that threaten our feeling of belonging, they change us. Enjoy this episode, and thanks for listening to the show! Thanks for listening to Episode 8 of The People People Podcast! “Where are you from?” This question is boring, predictable, and painfully dull when employed in conversation. But somehow, it is still REALLY important. Why is that? Why is it that we seek to understand a person’s geographical roots as a shortcut to understanding who they are? What makes that a valuable human connection tactic? Alex Taylor (@alext_sigmanu on Insta and Twitter) is a southern boy, ya’ll. And this episode explores the southern culture’s unique human connection eccentricities along with the big idea of how PLACE shapes our sense of identity. Alex and the podcast’s host Matt Mattson work together, but this conversation isn’t about work… it’s about humans, and connection, and all the things you’ve become used to expecting from the deep dive conversations that take place on The People People Podcast. Thanks for listening to Episode 7 of The People People Podcast! Here’s the story of this episode. Early on in the “dreaming phase” of this podcast, I saw on Instagram that my friend Mark was starting a beer blog (follow @thebeerdedlad). I like beer. And Mark and I knew each other a little through professional conferences, but we certainly weren’t close buddies or anything. So, we met at Living The Dream brewery in Highlands Ranch, Colorado (and later went over to Grist brewery). We ended up having a wonderful conversation (that you get to listen into) about life, the beer scene, the beers we were drinking, and human connection. It’s worth mentioning how awesome the people at Living The Dream were. I showed up before Mark and asked a bartender if there was any space that was quieter. While the recording doesn’t exactly reflect how much better the space that we found was, the LTD people let us into their private event room, gave us stickers out of kindness, and then comp’d our beer flights. Seriously, so kind. They were so Socially Excellent. Thanks for listening to Episode 6 of The People People Podcast! RJ Taylor is one of those people who absolutely oozes Social Excellence. He is approachable, friendly, kind, and cheerful… but he’s also clearly deep, seeking meaning from every moment, and has stories to tell that can inspire anyone. This episode, recorded this summer, caught RJ as he was smack in the middle of a 10 month mission trip around the world (learn more at https://rjandkaylataylor.theworldrace.org/). He and his wife, Kayla, have since returned safely and are doing incredibly cool work for an outdoor outfitting company in Michigan. RJ is a faithful and inclusive, bold and welcoming, gentle and driven soul. In the episode we talk about connecting with people across cultures, and we explore the idea of connection in many ways. Thanks for listening to Episode 5 of The People People Podcast! Vince Fabra is the guest on this episode of The People People Podcast. Vince is a professional speaker, stand-up comedian, and the host of a podcast called You Almost Had It (check that out!). He is a perpetual includer, a joy inducer, and he has the ability to draw out raw emotional connection with anyone. Seriously, he’s a unicorn of human connection. He oozes #SocialExcellence. This episode is full of real conversation about the stuff that brings people together (and the stuff that keeps us from truly connecting). This episode represents exactly what we want this podcast to become — pure, long-form, emotion-laden connection that is recorded and shared. You’ll hopefully find some inspiration and a little education along with some laughs built in. Thanks for listening to Episode 4 of The People People Podcast! How do great students build real connections with their students? What about with parents and other colleagues? Teachers have this intense, challenging, and thankless job, and our guest dives fully into how she makes an impact, and how she builds connection. Krista Hashemi is a ten-year veteran of elementary school teaching. She is teaching a class full of brilliant fourth graders this year at Ute Meadows Elementary School in Colorado. This episode explores the challenges and wonders of conversations and relationships with kids (and their parents). Krista uses the phrase “emotional vocabulary” in a fun way that is likely to stick with you for a while. What an honor it was for me to get to sit down with a teacher I respect and just dig into a rich and fascinating conversation. So grateful to have had the chance to do this. Can you reach out to a teacher this week? Perhaps one from your past? Or maybe, for those parents and grandparents out there, you can build a deeper connection with someone who teaches the kids in your life (they spend 8 hours a day with them!). Thanks to Krista and to Ute Meadows Elementary. Thanks for listening to Episode 3 of The People People Podcast! Why are we so afraid to talk with each other about faith, religion, spirituality, or the things we find sacred… outside of the walls of a traditional religious building? Should we save conversations about the biggest questions of life and death for only formal weekend morning lectures and funerals? That seems absurd. This episode features Pastor Justin Spurlock, the senior pastor at Grace Presbyterian Church in Colorado. Justin and I dive deeply into the questions above. Justin and I have a history of meaningful connection. He’s one of those people who isn’t afraid to dive into big conversations in big ways. Maybe that’s partly because of his vocation, but he’s also a person who has obviously made a choice to put Social Excellence in the middle of his lifestyle. I hope this episode inspires people to dive into some big conversations about big topics this week. Talk about the big questions of life. Dive in. Learn from each other and find inspiration in the viewpoints of others. Perhaps you’ll find divinity in that connection. Maybe God, whatever that means for you, lives in the space between us. Thanks for listening to Episode 2 of The People People Podcast! Jessica Pettitt (learn all about her and buy her book at www.goodenoughnow.com) pulls together her stand up comedy years with 15+ years of diversity trainings in a wide range of organizations to serve groups to move from abstract fears to actionable habits that lead teams to want to work together. With a sense of belonging and understanding, colleagues take more risks with their ideation, conserve precious resources through collaboration, and maintain real connections with clients over time. I’ve been lucky enough to be friends with Jessica for years now. We normally cross paths at professional conferences and speaking engagements… but she’s one of those people that just seems to make others around her feel comfortable so that they can engage in the difficult questions and conversations of life. This “interview” was raw, and real, and unscripted. You never know where a conversation with Jessica is going to go, and this one was no different. I feel like we hit some practical, meaningful, helpful points, and I’m so grateful for Jessica choosing to give her time to The People People Podcast. Enjoy! P.S. We reference “our book” a bunch of times, because Jess was kind enough to be an early reviewer. We’re talking about Social Excellence: We Dare You, of course. How cool is it that she gave it away to those big time thinkers! Thanks for listening to Episode 1 of The People People Podcast! Thanks for giving our podcast a shot. Just to give you the lay of the land, The People People Podcast is a production of The Social Excellence Project. The Social Excellence Project is a company we started a few years back to spread human connection and to help more people live a Socially Excellent lifestyle. You can learn more at www.social-excellence.com, or if you go to www.peoplepeoplepodcast.com you’ll get to the same place. We’re passionate about this idea of Social Excellence. It has changed our lives and the lives of thousands of others who have read the book, seen our talks, or who have plugged into our other educational offerings. I (I’m Matt Mattson, host of the podcast) could think of no better way to start off this podcast than by holing up in a hotel room and having a long-form conversation with one of my best friends, Josh Orendi. Josh and I started our companies together over 15 years ago and we've been having an evolving version of the same conversation as often as we possibly can throughout all those years. We talk about how to bring more people together to make the world better. That's what all of our work has been about. That's the point of The Social Excellence Project, and that's the point of this podcast. 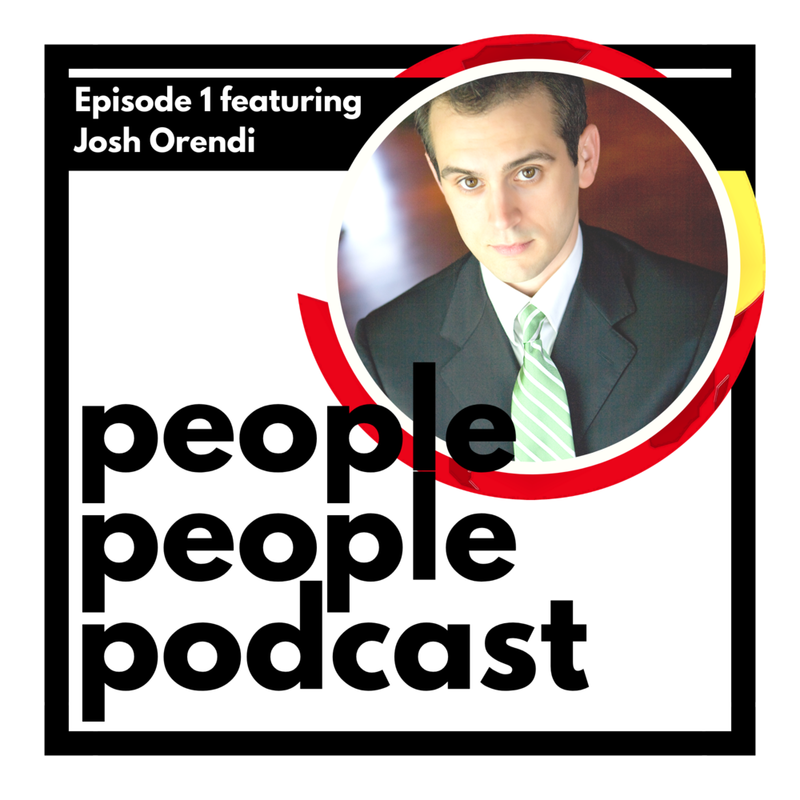 Josh and I talk about a bunch of stuff in this episode, but mostly we talk about why we believe Social Excellence matters to individuals, to groups, and to the world. This isn't a "canned speech," this isn't a "polished talk." This is just two buddies with a dream talking about it... and inviting you in.